Thanks to everyone who has been updating us on this crash on Olson Place, east of Roxbury. No injuries, apparently, as Seattle Fire has not been dispatched, but most recently, we are told, it is blocking one lane each way. The vehicle that spun out is reported to have hit a tree. If you need a few things … and/or just like to shop garage sales, rummage sales, yard sales, whatever you want to call them … head north and shop West Seattle Community Garage Sale Day tomorrow (9 am-3 pm, Saturday, May 9th)! Our partner site West Seattle Blog presents/coordinates WSCGSD, which this year has a record 340+ sales. The online map is here, and that page includes a link to a printable version (21 pages of sale descriptions and map sections). 11:53 PM: Still trying to unravel exactly what happened, but Seattle Police tracked a suspect into White Center tonight and have just taken him into custody near Marv’s Broiler in downtown White Center. 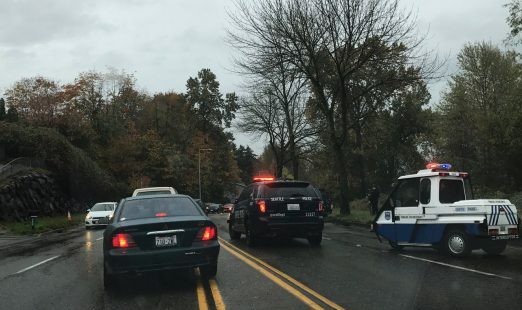 The call apparently started with a report of a man with a knife in South Delridge; SPD was searching, and then found their suspect, who was reported to have been on a bicycle. King County Sheriff’s Deputies were on the case too. We’ll add anything more that we find out. 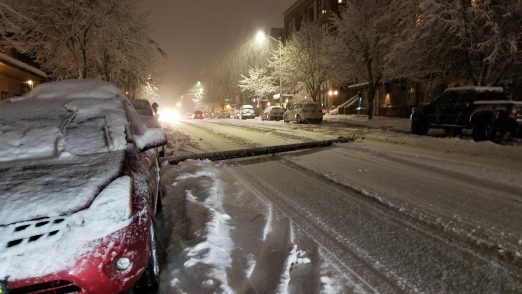 ORIGINAL REPORT: If you’re seeing Seattle Police and helicopters, there’s a search under way in White Center after a man who stole a vehicle with a baby inside ditched the vehicle, a black Ford Edge. Searchers are looking in an area including the 13th/100th vicinity. The baby is OK. If you see anyone suspicious, call 911 ASAP. 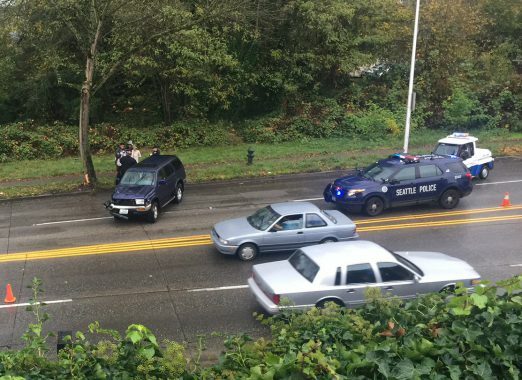 More details on our partner site West Seattle Blog; the SUV was stolen in Highland Park. UPDATE: A suspect is in custody, arrested at 17th/Roxbury. May 9th, 2014 Tracy Posted in West Seattle, White Center news Comments Off on Invitation: Come shop West Seattle Community Garage Sale Day tomorrow! Just a quick invitation to head north and shop West Seattle Community Garage Sale Day tomorrow (9 am-3 pm Saturday, May 10th) – more than 280 sales of all sizes, just a few miles away. In Arbor Heights and Shorewood, they’re even closer – just to the west – check out the online and printable versions of the map, including classified-ad-style listings for each one highlighting featured items, by going here. Just north of White Center, it’s the 9th annual West Seattle Community Garage Sale Day – which your co-publishers here coordinate/present on behalf of partner site West Seattle Blog. 280 sales are on the WSCGSD map this year. You are cordially invited to check them out between 9 am and 3 pm – find the online, printable, and mobile versions of the map on this WSB page. Gather with your West Seattle/White Center neighbors this Saturday at Chief Sealth. On Saturday, May 4th, at 9:00 am at Chief Sealth International High School, VIEWS (Visualize Increased Engagement West Seattle), Southwest Youth & Family Services, the Delridge Neighborhoods District Council, and the Southwest District Council will present the 2013 edition of the Gathering of Neighbors. GON has also partnered with the City of Seattle, Seattle Public Utilities, Rainwise Program to offer Delridge residents the opportunity to learn how water barrels and rain gardens can help improve the environment. SPU and their contractors will be available to demonstrate and answer all your questions. 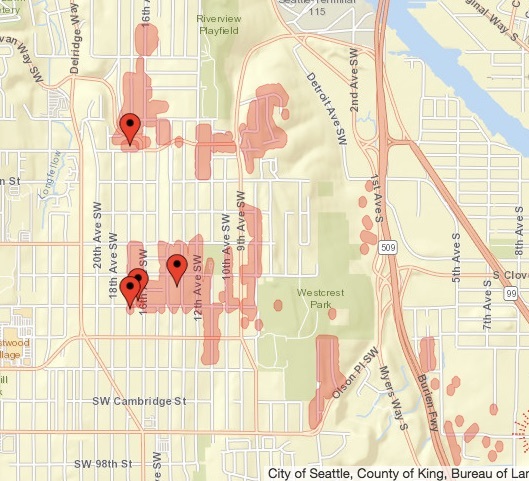 Ø Should We Elect Our Seattle City Council by Districts? Chief Sealth IHS is at 2600 SW Thistle in West Seattle. On Neighborhood Appreciation Day (Saturday), Jenna Lutton’s Gildenfire Dance held their annual performance for the residents at The Kenney [in West Seattle]. At the end of the performance, Jenna announced that Gildenfire has found a permanent home and she’s launched a crowdfunding campaign to raise $5500 for a dance floor and mirrors to transform the space into an amazing dance studio. The new home of Gildenfire will be in White Center, located behind McLendon’s. The Gildenfire fundraising page on IndieGogo reveals that as of this writing, they’re already 80 percent of the way to the goal. While following up on an incident reported in the latest WSBeat police-report roundup on partner site West Seattle Blog, we confirmed that a dog found in the Myers Way “woods” with its owner, just southeast of White Center, is the same one sought in connection with a much-reported attack in Shorewood. That attack injured a dog and its owner, as first reported on the Shorewood on the Sound Facebook group page. The man found with the dog off Myers Way is in jail because of warrants, as noted in the WSBeat report; King County spokesperson Cameron Satterfield told us that the dog is in the county facility in Kent and will remain there while its owner works through his legal problems – Seattle Animal Shelter took the dog from the Myers Way scene on Saturday, and then turned it over to the county. The owner has been cited, Satterfield says, including a “removal order” served to him in jail – if he reclaims the dog, it cannot be kept anywhere in King County. (Crossposted from partner site WSB) The West Seattle Lions‘ mural at 17th and Roxbury is now officially dedicated – a reader shared photos from the event, including artist Xavier Lopez Jr., above, signing his creation. Last month, Lopez was honored as a White Center Hero for his role in the mural art that’s popping up all around White Center and South Delridge, including the new Lions mural. A map to all the White Center-area murals can be found on the WC Chamber of Commerce‘s website. 4:52 PM: Seattle crews are handling it right now, but this is likely to affect traffic to/from White Center for a while – a crash at 8th and Roxbury. 8th is reported closed north of Roxbury; we’re waiting for our crew to report in with word on whether all of Roxbury is affected, or just the westbound side. 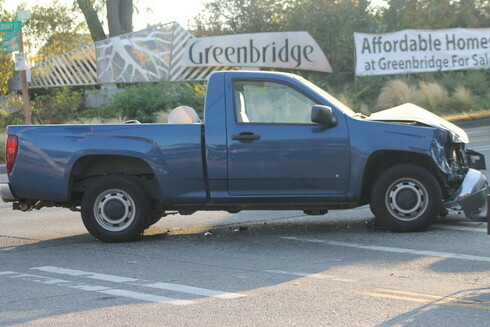 Two vehicles and a motorcycle are reported to be involved in the crash. 5 PM UPDATE: The crash is on the Seattle side of Roxbury; both directions of traffic on Roxbury are getting through. No one involved was hurt badly enough to have to go to the hospital. The two vehicles are both pickups, including the one in our top photo. Through our original site West Seattle Blog, we organize the annual West Seattle Community Garage Sale Day. Tomorrow (Saturday, May 12th), is the 8th annual edition, and it’s the fifth year we have organized/coordinated it. If you’re interested in heading out to shop – official sale hours are 9 am to 3 pm – not only are more than 240 sales registered for all around West Seattle, there are also a few here in White Center. Go to this page on WSB to see both the online map – which is clickable and zoomable like most online maps – and a link to the downloadable map you can print as a 12-page PDF. Covering Seattle Mayor Mike McGinn‘s Town Hall last night in Delridge for partner site West Seattle Blog, we spotted Aileen Sison participating in the community-information fair that preceded the event. 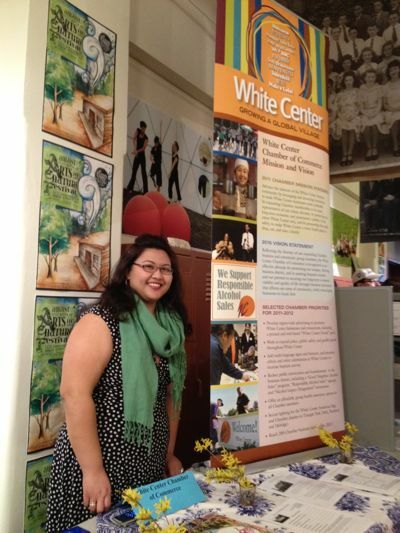 She was there to represent the White Center Chamber of Commerce, answering questions and share information about WC; area residents were invited to browse the information fair in the hour before the mayor spoke at Youngstown Cultural Arts Center. Recycling your tree: Here are some options! January 2nd, 2012 Tracy Posted in Burien, Environment, Holidays, West Seattle, White Center news Comments Off on Recycling your tree: Here are some options! If you had a one-use tree this holiday season – here’s how to recycle it. Waste Management collects Christmas trees from its residential customers. Be sure the tree is cut into three-foot sections and remove any tree stands, nails, tinsel and decorations. 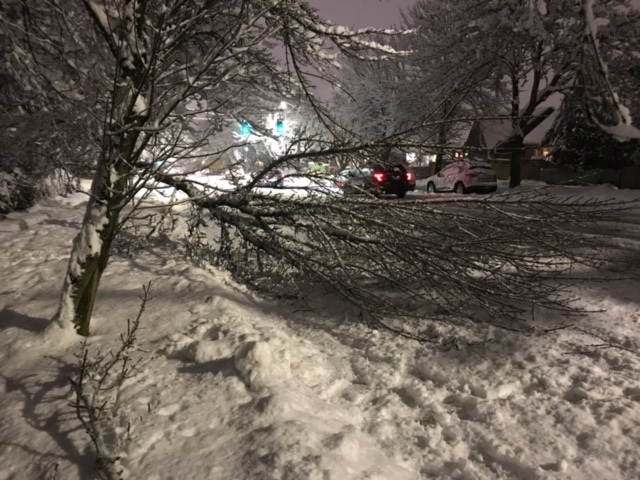 If you are within Seattle city limits, you can take your tree to the South Transfer Station in South Park, as long as it’s not taller than eight feet (rules here). SATURDAY, TWO LOCATIONS: The West Seattle Rainbow Girls will hold their fifth annual Christmas tree recycle fundraiser January 7 at the Alki Masonic Hall 4736 40th Ave. SW. and also at the Southgate Masonic Hall located at 1004 SW 152nd in Burien from 10:00 – 2:00. Suggested donation $5.00. No flocked trees please. 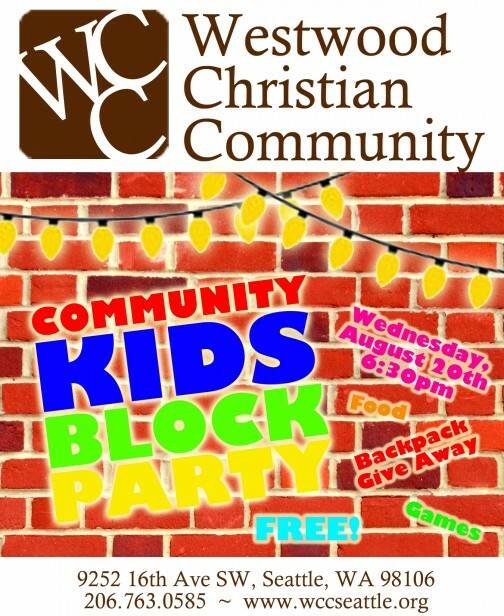 For more information please contact Jan Hunter at 206-849-7906. Check out the Rainbow Girls by going to www.gorainbow.org. 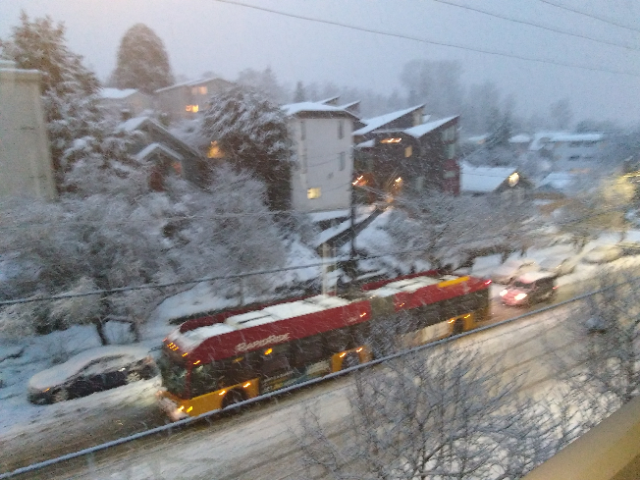 As first reported on partner site West Seattle Blog: The Roxbury/Delridge/15th intersection was closed for a short time tonight after a bus hit a woman. The response by Seattle Fire and Police was initially major because the woman was reported to be trapped under the bus, but it was determined that she was not trapped after all. She was taken to the hospital but not reported to have serious injuries. The intersection is open again now (as we publish this at 9:34 pm). Also on hand was Meach Sovannara from the Khmer Post Media Center in Long Beach (Calif.). The dispute is over a border area near the Preah Vihear Temple, a UNESCO World Heritage site that is more than a millennium old. The Cambodian-Americans say the most recent skirmishes killed Cambodian soldiers, and are demanding that the Thai government stop what they call an “invasion.” They want United Nations intervention as well as President Obama and the rest of the international community. According to this story from the Bangkok Post, this issue will be brought to the UN Security Council on Monday, and reportedly Cambodia will claim it’s at war with Thailand. There’s more background on the century-long conflict over the temple in this Jakarta Post story.